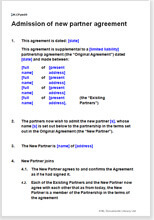 A simple agreement whereby the old and new partners are joined in the terms of the original partnership deed. The old partners give an indemnity against problems which might arise in connection with the time before the introduction of the new partners. Admission of a new partner into the business.